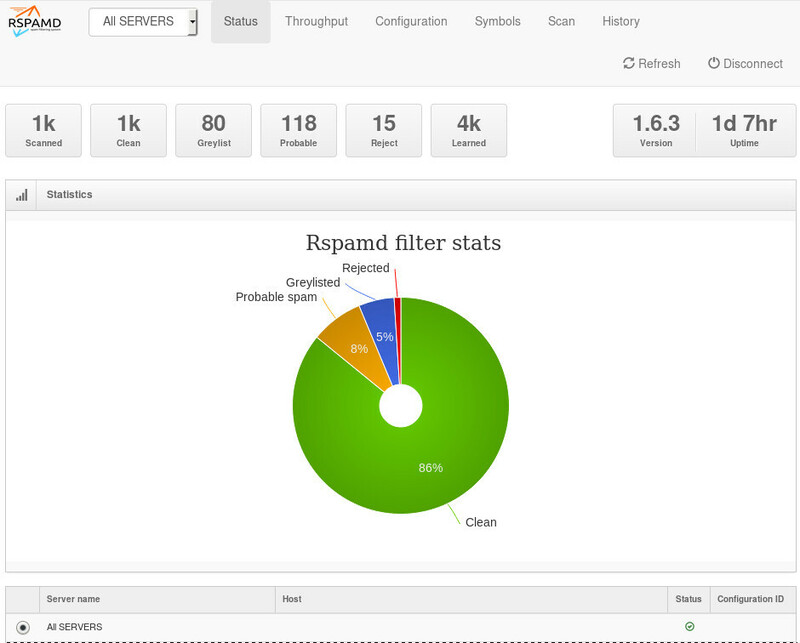 Rspamd is a rapid spam filtering system. Written in C with Lua script engine extension seems to be really fast and a really good solution for SOHO environments. In this blog post, I'’ll try to present you a quickstart guide on working with rspamd on a CentOS 6.9 machine running postfix. DISCLAIMER: This blog post is from a very technical point of view! In a nutshell, postfix will pass through (filter) an email using the milter protocol to another application before queuing it to one of postfix’s mail queues. Think milter as a bridge that connects two different applications. In Rspamd 1.6 Rmilter is obsoleted but rspamd proxy worker supports milter protocol. That means we need to connect our postfix with rspamd_proxy via milter protocol. On MTA integration you can find more info. ## A list of Milter (mail filter) applications for new mail that does not arrive via the Postfix smtpd(8) server. ## A list of Milter (mail filter) applications for new mail that arrives via the Postfix smtpd(8) server. ## skip mail without checks if something goes wrong, like rspamd is down ! Looking through logs may be a difficult task for many, even so it is a task that you have to do. Everything seems fine with postfix. If you have already a spam or junk folder is really easy training the Bayesian classifier with rspamc. That means every day, search for new emails in my spam folder and use them to train rspamd. First of all seriously ? There is a nice and simply way to split a mbox to separated files for rspamc to use them. 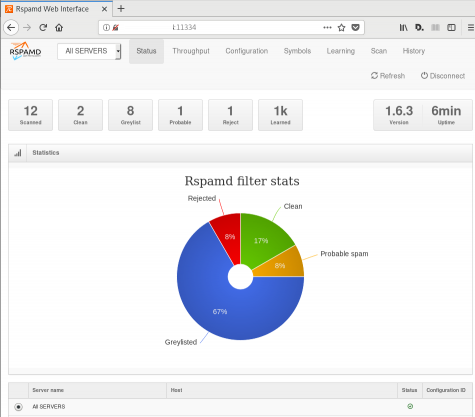 Rspamd comes with their own web server. That is really useful if you dont have a web server in your mail server, but it is not recommended. It is a good tactic to change the default password of this web-gui to something else. always a good idea to restart rspamd. I dont like having exposed any web app without SSL or basic authentication, so I shall put rspamd web server under a reverse proxy (apache). I am using rspamd for a while know and I am pretty happy with it. I’ve setup a spamtrap email address to feed my spam folder and let the cron script to train rspamd. In many companies, nagios is the de-facto monitoring tool. Even with new modern alternatives solutions, this opensource project, still, has a large amount of implementations in place. This guide is based on a “clean/fresh” CentOS 6.9 virtual machine. BE AWARE this is not the only problem with selinux, but I will provide more details in few moments. This is a common error, and means that we need to define a ServerName in our apache configuration. 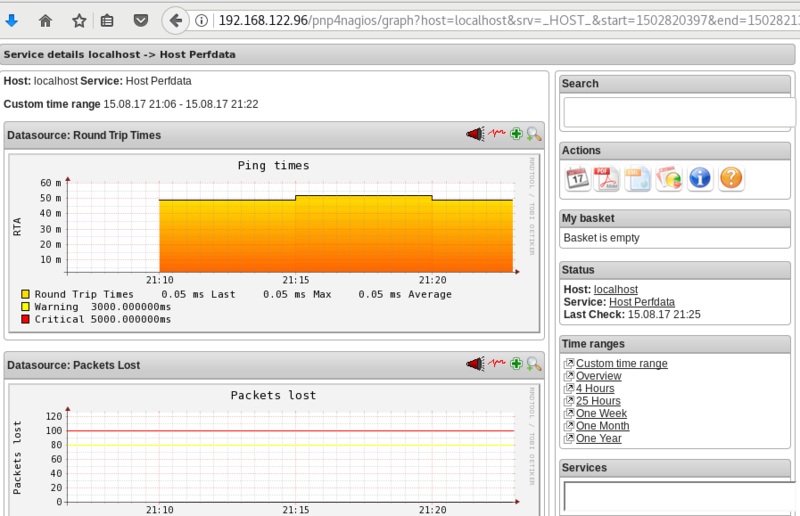 It is time to fix our firewall and open the default http port, so that we can view the nagios from our browser. That means, we need to fix our iptables ! We are ready to fire up our web browser and type the address of our nagios server. but we can change them! so that htpasswd will update the default nagios password entry on the /etc/nagios/passwd with something else, preferable random and difficult password. ATTENTION: e4j9gDkk6LXncCdDg is just that, a random password that I created for this document only. Create your own and dont tell anyone! at this moment and if you are tail-ing the selinux audit file, you will see some more error msgs. Below, you will see my nagios_t selinux policy file with all the things that are needed for nagios to run properly - at least at the moment.! you can install it, but does not resolve all the selinux errors in audit file ….. so …. Nagios is the core process, daemon. We need the nagios plugins - the checks ! but I dont recommend it. It is time, to add pnp4nagios a simple graphing tool and get read the nagios performance data and represent them to graphs. In the end … this is what it works - so try not to re-invent the wheel , as I tried to do and lost so many hours. You should see some warnings but not any critical errors. A few days ago, I wrote a simple wiki page on how to Authenticate to a web site using LDAP backend. There is a cool (and very simple way) to use Web Roles by matching your user’s ldap attributes to your web app. A RFC 2255 from 1997 exists on how to implement (and use) the LDAP URL Format. The authldapurl syntax from mod_authnz_ldap explains that the “attribute” field can be used with comma to separate different attributes. Every attribute would be passed to your webserver as an AUTHENTICATED_attribute variable. This is pretty simple to even document, but i need a reference point ! AuthName "Enter At Your Own Risk"
Header always set Strict-Transport-Security "max-age=31536000; "
It took me a few minutes to understand why one of my online sign files isnt the correct one. A colleague of mine wants to add a new vhost on one of our apache web servers. he noticed that php_admin_flag had produced an error msg. We comment this flag out and tried to restart the web server. Unfortunately the httpd didnt came up. There is NO php on the system! A couple weeks ago, another colleague did a not so successfully update on this server. So keep it in mind that after yum update, you have to do manual restarts on the running services and check that everything works properly OR someone like me, will try to destroy your Christmas plans as a revenge !